Wordless Wednesday - "The Patch"
I'm desperate for a post at the moment. Yes, I know that I still owe pictures of the Lincoln Log Western town ... I have to unload the memory card, the camera needs to be recharged, and I'm not sure where the USB card reader is at the moment ... lame excuses every one, yes, yes, yes. My extremely perceptive friend, whom I shall refer to as B, assumed correctly that I was in the place that, accurately described by B, "resembles the hamster ... that jumps on the wheel and keeps running and running and running until you feel like you're going to scream". Author's note: B is quite the perceptive one! Thus said, I have not been able to focus - not on my business, not on my blog, not really on anything (okay, the temporary diversion of the Lincoln Log town excepted). It's difficult being far removed from my family members and just waiting for updates. I completely understand and respect the situation, but the hamster needs it's exercise, thus rendering the rest of me relatively useless. So, anyhoo ... in trying to fill my days of unfocused energy ... a couple of things have happened. I found a book called Twilight by Stephanie Meyer - which unfortunately or fortunately has 4 books in the series. I do believe that I am the last person on the face of the earth to read it, but as I did read the Harry Potter series, I feel obligated to keep in touch with my inner teen. As I told B, " I have been letting the hamster had a bit of a lie-in so that I can read these books from cover to cover ... actually, maybe the hamster power has fueled my ability to stay up to read." It feels like an addiction ... I am completely and utterly lost in this series. I cannot put the books down. I take them everywhere. And, being that it has quite an appropriate cast for the month of October - vampires and werewolves - I feel slightly redeemed. Plus a good Romeo/Juliet/Paris vibe and extraordinary photo covers. The other thing that happened is "Extra" ... which has perpetuated the addiction to the Twilight series ... but that will be another post. Don't give up on me, I'll be back. It's been a relatively quiet week in Lisa's Land-o-legos. Unfortunately, my cousin had a blood clot at the base of his brain which caused a stroke late last Friday and then a subsequent one on Monday. For the last seven days, we've all been in wait mode. Please send him and his family loads of positive energy and prayers. Dealing with crisis brings out some interesting traits in me. Over the years, when in crisis mode, I've turned into a matron of cleanliness (the scary freaky kind that scrubs floors with toothbrushes), organized closets and drawers (think Mission Organization), and attempted to exercise away every ounce of energy. In this particular case, I've spent hours running (at a time) ... which is easy when you don't run very fast and built a Western town, replete with a bank, trading depot, Sheriff "station", private residence for the token girl, and a school with a playground. All constructed not with Legos (horrors) but with Lincoln Logs ... alot of them, and I do mean alot. I really should take a picture of it. 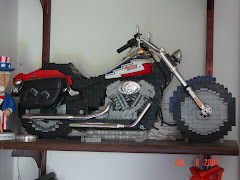 And if anyone is wondering (heh heh heh), it was my son's idea to build it. Since I feel oddly silent, I'll log (Lincoln log, that is) off for now. But check back for a photo shoot - although, I might have to clean up first ... too bad I didn't opt for the matron of cleanliness trait this time around. ... Marathon ... yep, there's something called an ULTRA MARATHON. And, here I thought that running 26.2 miles was pretty ULTRA. I am so naive. I have more than one friend who have completed Ironman Triathlons (you know, the ones where you swim 2.4 miles, bike 112 miles, and THEN (as if the swimming and cycling portions weren't ENOUGH for you) run a full marathon, 26.2 miles. And, they have done it ALL IN ONE DAY - and I mean the SAME DAY. I was amazed by that, even more so when I completed my little marathon - knowing that I ran 26.2 miles in the time it takes some to complete a full Ironman. So, today, I was viewing another friends fabulous photos of his sister's wedding in South Africa (apparently they invited elephants, zebras, giraffes, hippos, and a lion - or maybe the lion just crashed). Enthralled with the pics, can you imagine getting married with safari animals in your wedding party? Well, maybe they weren't exactly in the wedding party, but they were pretty darn close - beautiful pictures, fabulous experience for all involved to be sure. Now, where was I? Oh, right, so I'm on a virtual safari, living vicariously through my friend's pictures, and an ad pops up about David Goggins and the ULTRA MARATHON - that's 150 (ONE-HUNDRED-AND-FIFTY) MILES. In one day ... well, actually, it's about 30 - 35 hours, but it's not over a period of say, a month, it's at one time. I'm still kind of in shock - first the elephant peeking out of the foliage at a wedding, then a video of a guy running 150 miles. I may need to start happy hour a bit early. His perspective is a good one - "if you can SEE yourself doing something, you CAN do it" - you will do it. I think that applies to just about everything. If you see yourself succeeding at something, no matter what that something is, you will succeed. His motto is "Show No Weakness" - how Navy Seal is that? I also like what he says about hitting walls - apparently when you run 150 MILES at one time, you hit more than one (no, really?). He says that when he hits a wall, he knows there's a door and he looks for it - because when he finds the door, he has to make a choice of whether or not to go through it and that choice of getting through the wall helps him get to the next point. Anyway, the video definitely worth watching. And, no I'm not going to post any Youtube videos by Pink - ew. Clearly, that would be just plain wrong (um, wrong for me, that is). I'm sure there are those who are um, fans, somewhere ... and I'm certain, you're lovely people, but we'll just have to disagree that Pink is a credible musician - she's no Steven Tyler, after all, although there is a weird resemblance in some photos, and I can't believe he's actually Liv Tyler's father ... but I'm digressing. October is Breast Cancer Awareness Month. I have a cousin who is a breast cancer survivor as well as several friends who are breast cancer survivors. These women rock! I wear my pink ribbon to honor them and their courageous spirit. It's amazing to me how many people are indirectly affected by this disease. I was in a seminar once when the speaker asked the following questions to a group of about 100. He had everyone stand up - then asked for the people who were cancer survivors to sit down. Then had those people who had family members who were dealing with cancer or who had dealt with cancer to sit. Then had those who friends, neighbors, and/or co-workers who had experience with cancer to sit. At this point only about 10 people remained standing (out of one HUNDRED). Finally, he asked those 10 if they knew of a friend or spouse of a friend ... yep, everyone else sat down. So out of 100 people in a room, everyone was at least indirectly affected by this disease. So, I encourage you to think Pink this month. You can contribute here, buy merchandise here, or at least click to support free mammograms here. Here's a little something from the "softer side" of Steven. Um, guess which one I'm choosing? I could wax philosophic on you, but in light of the fact that I embedded an AC/DC song, I don't feel philosophic and I wore a black T-shirt and sandals today. All of you NEED this ... you CANNOT live without it ... not only it is adorable, slimming, and alluring, but you MUST have it, MUST, MUST, MUST! Dear Friend, Vixen, has just launched a new site, Apron Frenzy. Guess what she's selling? Ah common, you can do it. I looked up the word, Frenzy. Dictionary.com says it's "a fit or spell of violent mental excitement". So, in that vein (or vane, if you want to go the pun route) ... it's October for goodness sake, put a little "Boo" in your Kitchen Booty! Get radically excited, wave those arms, dial those digits, type that URL, and click, click, click. Oh, and just so you know, she's having a contest, too. 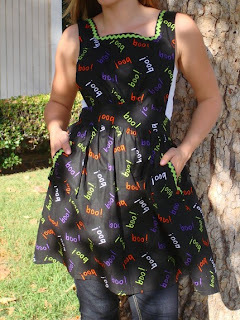 Check out her site for the rules - the prize is a cute little fall apron! I'll be back in black (most likely) - later in the week!